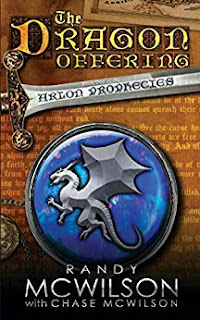 Don't miss this fantasy ebook deal! Arlon was the most important person in his kingdom, and he hated it. He was one of only a handful of people in the Five Civilized Kingdoms born with the birthmark. He was a Child of the Mark. A Chosen Child. The ancient prophecies were clear...seven Dragons would rise to power. Six had come and gone over the past 6300 years, the majestic Seventh Dragon was about to be born. Terras Telos...the final prophesied Dread Guardian to rule over the world. Only a Dunamai could approach a Dragon. Only a Chosen Child could make an offering to the newborn Dragon. The stakes were unimaginably high...and Arlon knew that only one of them would be accepted. His entire teenage life had been a preparation for one single day...the day of the Dragon Offering. No one could have ever imagined the incredible and tragic series of events that would be unleashed by a young man's simple desire to be free.